Sometimes, getting anything done in this convoy roughly resembles herding cats. This morning, we are packed and ready to hit the road before anyone on our team is even awake. Hoping they'll be up soon, we head into town to purchase supplies for our next few days in the Mongolian steppe. When we return, they're still sleeping soundly. It is noon by the time they emerge, bleary eyed, in search of caffeine. Over coffee and English breakfast in the camp's restaurant ger, everyone slowly comes to life. As they tell stories about last night's vodka-fueled alcohol binge, we're eager to get going, silently hopeful we can hit the road in an hour or two. Just as it looks like things are about to start moving, our team decides to run to a nearby river to get washed up – with an inflatable raft in tow. Crestfallen, a little exasperated, and feeling very boring, we sit down to put the finishing touches on our Rough Guides project. At least we'll have some quiet time to complete our articles. When we're satisfied with our writing, our team still hasn't returned. Now killing time, we start in on a much needed round of laundry. We're wringing out the last of our underwear, laying them in our LRC's warm rear-window, when at last, everyone files back to camp, happy, wet, and clean. It is nearly 2PM and people are just now getting around to packing. Two more hours have passed. Somehow, we're not much closer to leaving. In our minds, we've missed the window where makes sense to leave; there is really no point in going anywhere now. We may as well just finish our errands and spend one more night at the comfortable ger camp. Then, with any luck, we can leave first thing in the morning, giving us a chance to make some distance. We try our idea on for size, but everyone is keen to leave, now feeling in a hurry to get moving. They want to free-camp outside of town to save money. Feeling exasperated, we joke about how this whole convoy thing is starting to feel like a bad relationship. We love them, but sometimes, we can't stand being with them! Seriously though, we're finding it difficult to acclimate to the realities of traveling in a group. On our own, we can do as we please, when we please, at the pace we please. It isn't much of a leap to realize that things change drastically when you add three cars and five people with no leader to the mix. We're doing our best to keep up, but it is a little overwhelming. Relinquishing control continues to be a skill required for happiness on the road. Despite the difficulties we're having, the sacrifice of freedom is well worth the cost. Every person in our group has something unique to share, and we're really having fun getting to know them. Most of our adventure has been focused on observing and absorbing as much as we can about the countries and cultures we encounter. Quite unexpectedly, Mongolia, perhaps the most foriegn of all our destinations thus far, has become something entirely different. It is an interesting change, connecting with people for more than a day again. Charlie's geeky enthusiasm for understanding how things work really resonates with me. Tim's dry wit is hilarious, and I find his halcyon nature totally disarming. Mette is a bit of a tough nut to crack, but a well earned laugh from her is particularly rewarding. Freddie's hypnotic voice and musical talent are a joy to be around, and Richie's mellow attitude really reminds us of The Dude. While we may not experience the heart of Mongolia as deeply in this group as we would alone, we are forging friendships and memories of a different nature that will surely stand the test of time. We're finally ready to leave when our team decides to get a late lunch. By now, we've accepted our fate: we will accomplish nothing today. After eating, the faffing around continues unabated. We're milling about by our cars when Tim leaves the group, walking across the street with purpose. Before we can ask where he is headed, he turns around and shouts, "Looks like a nice shop!" *comedic pause* "Dunno why." We turn our gaze to where he is now clearly headed. There, in front of him, is yet another Mongolian hole-in-the-wall mini market, its name clearly marked with a huge sign above the door: NICE SHOP. We're cracking up as Tim turns around and flashes his endearing, cheeky grin, just to see if his joke has registered. The sun is beginning to set when, at long last, we take to the road. It's not just our friends traveling with us today; last night the convoy adopted two more cars and the five people in them. They're fast drivers though; they've zoomed on ahead of us. Though we were going to meet them by a large lake for the night, when we arrive, our new team members are nowhere to be found. Night is fast approaching, so we decide to make camp without them. Just as we're about to pull out our sleeping bag, a Mongol Rally car turns up, lights flashing at us! It's Alex in a Citroen Saxo, coming to get us. The others aren't too far away, so he says we should follow him and set up camp together. After some confused circling in the desert, we find them, drinking beers around a fire. Our convoy's dedication to boozing is impressive. The rest of the evening is spent slowly stirring a massive pot of spaghetti for dinner, and telling stories. We listen long into the night as our new teammates (Gem, Matt, Alex, Tommy, and James) talk about their travels, and also what they do in their normal lives back home. I am excited to learn that Tommy is an accomplished boat rigger from Cornwall, and resolve to learn a knot or two from him before the trip is over. While the getting moving part of being in a team is often frustrating, spending our nights under the starry skies of Mongolia, warming ourselves around a fire, and enjoying good food with new friends is hard to beat. 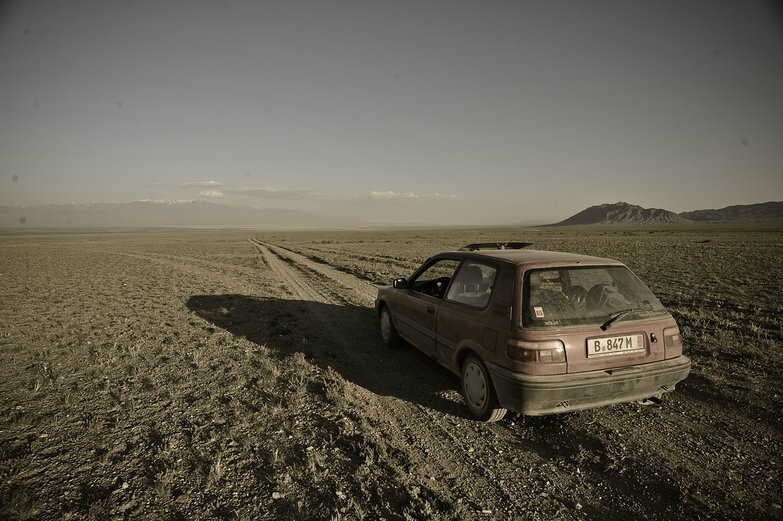 At this breakneck pace, it may take us a month to reach Ulaan Baatar. Thankfully, we have the luxury of time on our side. Sounds like a really fun group - I can tell you guys are hanging around Brits with all the "wellies", "cheekiness", "faffing around" and "car boots" :) Also, are your articles published on line? Can we read them?